Not to be confused with the Emmy Award-winning 1966 TV movie starring Robert Goulet and Peter Falk, Vincente Minnelli's Brigadoon (1954) was the first adaptation of Lerner and Loewe's popular Broadway musical. Neither version strays too far from the age-old legend of a "mysterious hidden city"; in this case, it's a remote Scottish village that appears for a single day once every 100 years. As luck would have it, American game hunters Tommy Albright (Gene Kelly) and Jeff Douglas (Van Johnson) happen upon Brigadoon by accident. It's nowhere to be found on their map of the Highlands, but they're hungry and tired enough to walk right in. It's a particularly big day in Brigadoon: Charlie Dalrymple (Jimmy Thompson) is set to marry Jean Campbell (Virginia Bosler), and food is on the house. Ever the gracious host, Charlie invites our hunters to the party as well...but Tommy seems more interested in Jean's older sister Fiona Campbell (Cyd Charisse). He's head over heads for the young Scottish lass almost instantly---much to the dismay of the more level-headed and sardonic Jeff---but it's not long before they learn the truth about the town's unusual history. Once that exposition is out of the way, Brigadoon lurches forward to the home stretch: the town's in danger after a citizen threatens to leave (which would break the spell, apparently), a terrible tragedy occurs, and Tommy seems reluctant to abandon his life in America. He just so happens to have a fiancée there, which makes his whirlwind romance with Fiona seem just a little more ill-timed. 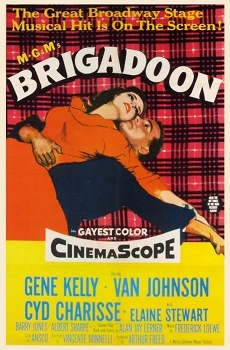 Budget and weather concerns prevented Brigadoon from being filmed in the Scottish Highlands, so the film was shot on MGM sets. This can't help but give Brigadoon a flat and somewhat lifeless quality, disguised occasionally by excellent background paintings, impressive set design, and colorful costumes. 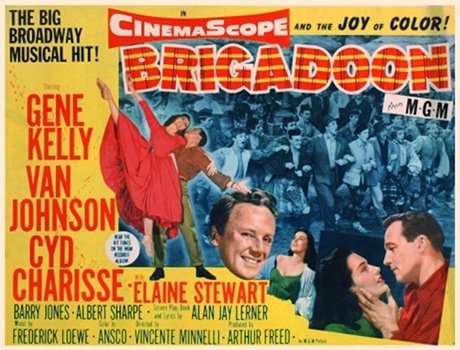 But Brigadoon's low-rent atmosphere---considering its more ambitious competition, at least---gnaws at the viewer every step of the way, regardless of Gene Kelly's infectious enthusiasm and formidable dance moves. Shot in the relatively new CinemaScope format and using the much cheaper single-strip Metrocolor process (as opposed to three-strip Technicolor), Brigadoon promises magic, mystery, and wonder...but feels more like the rehearsal for a movie that never starts. Brigadoon certainly has its moments: the first half is paced very well, Kelly and most of the supporting players do just fine in their roles, and the soundtrack is obviously home to a handful of memorable Lerner and Loewe tunes. Yet much of the film never quite escapes "average" territory in almost every other department, which makes it decent enough the first time through but low on replay value. Established fans, on the other hand, will probably be thrilled with Warner Archives' new Blu-ray edition: it offers an excellent A/V presentation and a few familiar DVD-era bonus features, although the lack of new material is disappointing. Easily outpacing the studio's own 2005 Remastered DVD and an earlier non-anamorphic edition, Warner Archives' sparkling new 1080p transfer looks better than expected. Shot in 2.55:1 CinemaScope, Brigadoon boasts excellent levels of clarity, detail, and texture, with improved shadow detail and black levels. Depth is also outstanding and the film's muted color palette is represented perfectly, while a natural layer of film grain is present to remind us that excessive digital noise reduction hasn't been applied. Compression isn't an issue either, as no artifacts were spotted during even the foggiest scenes. A few stray color shifts are noticeable at times (especially during dissolves), although this may be a byproduct of the color process. Overall, there's not much to complain about: Warner Archives' Blu-ray is just a clean, crisp presentation of a film that would've looked even better without the budget limitations. The DTS-HD 5.1 Master Audio soundtrack is similarly excellent, although the addition of an original four-channel mix would've been preferred. What we're left with isn't quite as overly aggressive as Warner's Remastered DVD, with generally well-balanced dialogue and music that's free from distortion; even so, this one's obviously mixed with larger rooms in mind, so you may want to keep your remote handy. Surround activity is limited and most of the front channels feel more flat than enveloping...but considering the film's age and source elements, Brigadoon still sounds quite good and Warner Archives' Blu-ray gets the job done nicely. Optional English subtitles have been included during the main feature, although they're printed in ALL CAPS like many of the studio's newer discs. Warner Archives' static interface is clean, simple, and easy to navigate, with separate options for subtitle setup and bonus features. This one-disc release is packaged in a standard blue keepcase with attractive poster-themed artwork and no inserts of any kind. Everything from the somewhat sparse 2005 Remastered DVD, which include three Outtakes, an Audio Version of deleted song "There But for You Go I", and the film's Theatrical Trailer. It's nice that we could at least get the old stuff...but considering Warner Archives' policy of not creating new extras for Blu-ray, it's a real shame more effort couldn't have been made the first time around. Brigadoon certainly isn't a classic musical by any stretch, as almost every notion of magic and wonder is woefully undermined by budget limitations. It's just kind of...there for 108 minutes and, though somewhat elevated by the pure enthusiasm of Gene Kelly, none of the characters are captivating enough to hide its obvious seams. Still, the set design and songs have their moments, while a number of laughs (intentional or not) keep the production moving along at a fairly good clip. Warner Archives' new Blu-ray will nonetheless please fans and first-timers with a solid A/V presentation, although the weak collection of bonus features hasn't been improved upon. But let's face it---most folks will find very little replay value here, at least not enough to make it worth buying. Rent It.